This will be my final post for quite sometime, This will be about Promise and Peril of Molecular Nanotechnology, Dealing with more philosophy than Synthetic Virology and Biochemistry. We have seen Molecular Nanotechnology in the form of Viral Nano-machines conquer disease in "Living Drug" and make a Genetically Engineered Felis Superior in How to make Cats Glow in the Dark. It seems that these sorts of technologies can be used in two major ways for peaceful purposes to Lengthen Life and to Enhance life, allowing for genetic alternations to be carried out after birth unlike previous methods. What will be the effects on society once humans begins to make the leap to something beyond Human. 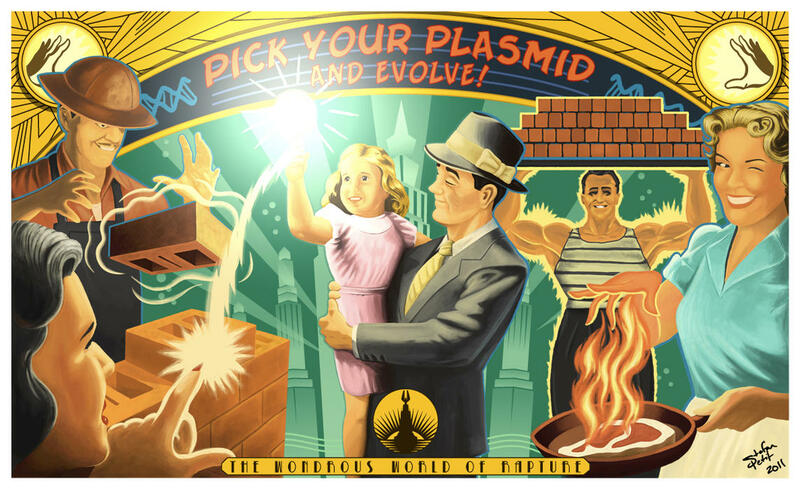 When I was younger I played the game Bioshock, which shows a society that discovered a way to genetically alter themselves, this was a society where the scientist was free to pursue his research despite morality and The man would earn what he works for by the sweat of his brow. 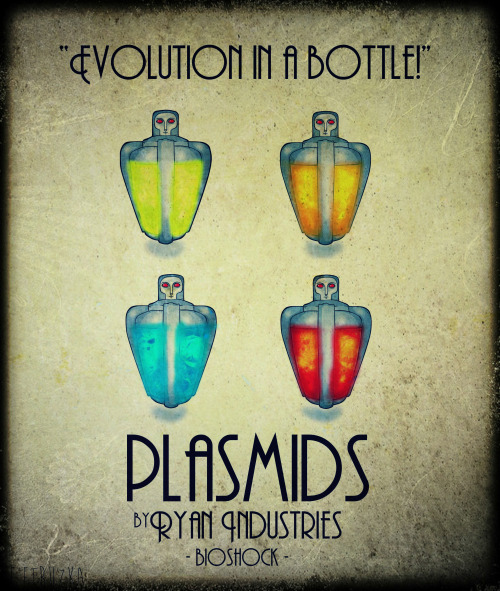 For those of you that have never played that discusses some of the deep moral aspects of Genetic Engineering as these "Plasmids" can edit anybody with cellular precision on the genetic level, sound familiar? It seems like a paradise right, well, you would be wrong and right....... For a time, until the Peril. The game begins after the Downfall of this civilization it shows the dire consequences of abuse of this technology, by this point people have literally become addicted like illegal drugs to Nanotechnology and those in power have misused this technology to control biologically their population directly. This being a far cry from the original intent of the discoverer of this Genetic editing technique, which for a time was a paradise for the common man, but even with the knowledge of E= MC^2 there was dire consequences with power comes responsibility. Biological weapons have been banned from use as a war crime under the U.N. B.W.C. 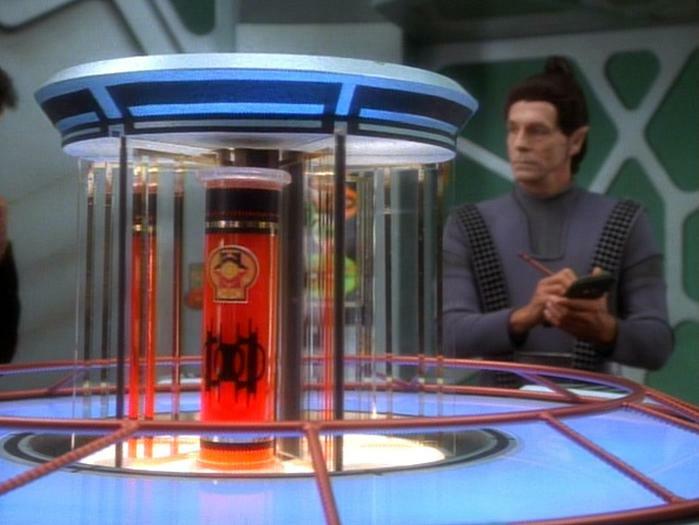 so the discussion will not be about weaponry if you use synthetic viruses as weapons you are likely to Nano-Apocalypse or Grey Goo your planet, watch Deep Space Nine episode, Armageddon Game about two Species that fight a war with Synthetic Viral Weapons, I imagine it would be something like that. These Harvester Weapons the name for their Synthetic Virological weapons, killed most of the population on both worlds in their war. This is why Self-replication has always been removed from all Nano-fabricated Viral Vectors. I would suggest never making ones that do, it is way too dangerous, all of these being above BSL-4, once you proceed into MV-x Series if self-replicating. If you doubt this look at a victim of Smallpox or Ebola then imagine a Virus with the targeting ability of both. You could make Synthetic Viruses that transfers to the body an Enzyme like a Acetylcholinesterase inhibitor which would act like an Organic Agent VX killing the subject within seconds, when transferred with a MV-7 or above which is able to target 99% of cell types using the right Glycoproteins. This is nothing new to the generations reading this being under the threat of Global Nuclear War our entire lives. This was a effect of splitting the atom and Oppenheimer's folly creating the Atomic bomb. There is no need for history to repeat itself our generations now and in the future are wiser than that. 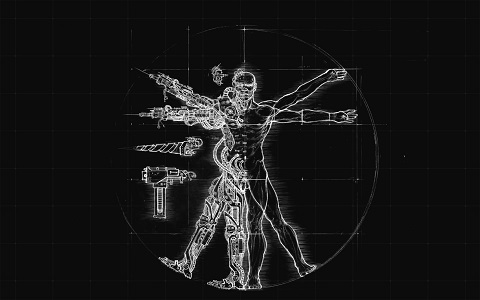 Another peril of nanotechnology is the ability for people to directly edit cells just as there are hackers on the internet steal computers, it stands to reason in the future corrupt people will attempt to make nanotechnologies that issue genetic alternations without the permission of the person. The possibility even exists to make devices that hijack control of the cells or mind of the host, "Molecular Control Agents". This is something that should never be researched and banned like biological weapons. This goes to another issue, such as those in China where embryos whom never got a chance to choose are genetically altered, I believe this is wrong. I realize it is to make natural immunity to diseases but if the alternation can be made after birth when the person has a chance to choose, I think it should wait. No one should be forcefully genetically engineered. Now that we are past the perils of Nanotechnology the evidence is there we can evolve, ourselves at will, it took 4.5 Billion years make it to this point, we have earned the right in 100,000 years of life and civilization to edit ourselves and become Homo Superior much like the cat given the proper time and research, we can become much more. 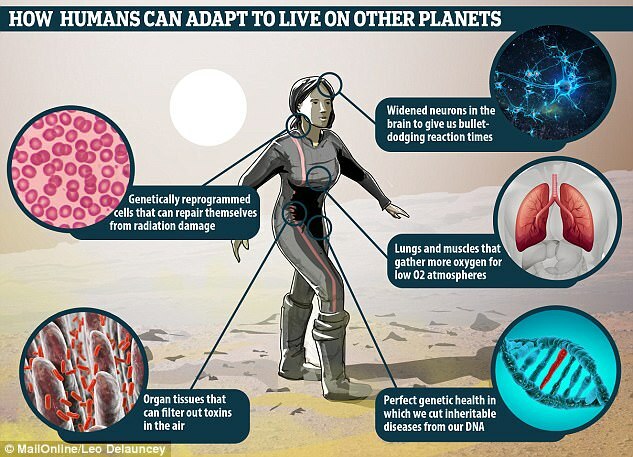 This next image is about how we might use Molecular Nanotechnology to live on other planets. You may think this as something as Science Fiction but quickly fiction is becoming reality all around us. Ray Kurzweil Google's Engineering Director believes that by the 2030s Nano-machines will flow through our bodies repairing our DNA and Cells, disease and aging will be a thing of the past when this finally happens, it seems we will have to wait for the next era, The Nano-Revolution after the current information age has ended, to the promises of nanotechnology, while being aware of the perils. First, Ray Kurzweil is perhaps the dumbest "genius" I'm aware of. He's perhaps a great electrical engineer, and was able to pursue his interests thanks to being born into a very wealthy family, but he doesn't understand a thing about nanotech. He just does a lot of hand-waving whenever he talks about it. It irritates the hell out of me whenever I hear him say things like "ten times as intelligent as a human." What the hell does that mean? And which human is he talking about anyway, Albert Einstein or Sarah Palin? How many times more intelligent is a person than a cat? Or a monkey? And which person, and which cat or monkey? For that matter, how many times more intelligent is one person than another? I've finally distilled my objections to what he says down to four words: "Intelligence is not scalar." Second, if you liked Bioshock, you should read the book "Atlas Shrugged". It's essentially capitalist propaganda, but it's where Bioshock got a lot of ideas from, and was written in the 1950s, which explains why Bioshock has that 1950s cultural feel. By the way, if you say this will be your final post in quite some time, does that mean you don't intend to respond to replies? Because that's awfully impolite, it means you're just talking at, rather than with us. No, that doesn't mean I will not answer to replies, I have been as I feel a bit spamming up this biochemistry forum, which the idea for the now many post Viral Plasmids post was inspired by the bacterial plasmid post, Ray Kurzweil did come from a wealthy family but he has many achievements that are commonly used in this day and age, such as the first omni-font optical character recognition, the first print-to-speech reading machine for the blind, the first commercial text-to-speech synthesizer, the Kurzweil K250 music synthesizer capable of simulating the sound of the grand piano and other orchestral instruments, and the first commercially marketed large-vocabulary speech recognition, he obvious does know much about computer programming and engineering. Secondly, what does he mean by more intelligent than human, for this to be seen you will have to watch a episode of jeopardy, about the super computer Watson, https://www.youtube.com/watch?v=WFR3lOm_xhE , this is about how this supercomputer can play jeopardy better than its human opponents being more intelligent than some of the best players, but there are many levels of intelligence being crafted from the Theory of Multiple intelligence, https://en.wikipedia.org/wiki/Theory_of_multiple_intelligenc... which computers have always beaten us in one being "Math Smart", but I think he means in a global sense of all of them or possibly just IQ it, it is hard telling what exactly is meant by "More Intelligent". If there is one generally accepted way to make yourself artificially more intelligent without work, it is Nanotech with the ability to edit your Biochemistry and Neural Chemistry, we all know this to be true as you could add the gene that made Einstein a genius or set of genes into a normal human having the Nerve cells respond the the change and restructure, but Einstein did say 99% Work and 1% natural ability was Genius, so maybe not given that ratio, you may need to just apply yourself. I am very familiar with the many works of Ray Kurzweil. If I wasn't, then I wouldn't have such strong opinions about him. Like I said, a skilled electrical engineer that doesn't know anything at all about nanotech and talks about it like it's magic. There's a reason that he spends all his time these days TALKING about nanotechnology rather than actually working on it though: he wouldn't know where to begin, so he's trying to get other people to work on it. Since he wants to be immortal, he thinks that if he can just promote this type of research enough, he can achieve his goals. He'll die with a normal human lifespan though, I guarantee it. The year 2030 is 100% wishful thinking on his part, and was calculated based on the fact that he wants to be alive to see it (and thus use it to attain immortality) rather than any real numbers that make any sense. One problem with his thinking is that he still hasn't learned the lesson that economists learned back in 1929: exponential growth never continues forever. It may hold true over periods of years or decades, but eventually, it hits some hard limit. For instance, Moore's law, which is the most well-known exponential formula applied to technological development, can't hold true forever, if only because devices (transistors in this case) can never become smaller than an atom. But because Ray Kurzweil has successfully predicted technological development in the past based on an assumption of exponential improvement, (he'd begin a project before the technology for it all existed, using an exponential model to predict when it would become available) he seems to think that he can make any wild extrapolation he can think of, using the same damn exponential model. Using nothing but exponential models to predict technological improvements, ends up resulting in a weird phenomenon called "The Singularity", which I personally don't buy into at all. Reason being, it ascribes human-like intelligence to AI, but then totally ignores the means through which mammalian intelligence develops and assumes that that part isn't necessary. Basically, the most intelligent mammals are the ones with the longest childhoods. For this purpose, we can assume that "childhood" is the length of time between birth and reproduction, and is primarily a period of learning. Humans, of course, have ridiculously long childhoods, which is a major evolutionary detriment. This sort of thing wouldn't evolve unless there was an enormous upside to counterbalance it, which of course, there is. That being, the many benefits of the technology and global society that our species' intelligence has allowed us to develop. In essence, what Ray fails to realize is that a computer can't learn just by sitting there being smart. Neither can a human, for that matter. Learning requires interacting with the universe via a lengthy process of trial and error. It also requires the ability to sort out correct and incorrect information, when sifting through all the data collected by other sources that's accessible to it. Since a combination of Heisenberg's uncertainty principle and chaos theory preclude perfect predictions in our universe, that means that there's no getting around the learning process for an AI, and also that an AI will need to use probability as a means of predicting events. The alternative to using probability is being "so smart that it can predict everything perfectly", which all the especially obnoxious futurists seem to believe is going to become the case. But what does AI have to do with nanotech? As it turns out, everything. You see, Ray Kurzweil has made a particularly dumb additional assumption: because of the enormous complexity involved, people will need to develop AI with god-like abilities in order to then develop the nanotech that Ray so desperately wants to believe will be available before he reaches the end of his natural lifespan. Of course, this involves no small amount of speculation, much of which assumes that artificial intelligence and biological intelligence are both scalar quantities, and thus have the ability to increase exponentially. If they didn't, then Ray's extrapolations would fall apart and he'd have to die eventually like every other damn human being that's ever lived. Also, you mentioned that it makes sense to talk about an AI perhaps being more intelligent than a human, and I agree. What I strongly disapprove of though, is how Ray Kurzweil throws around phrases like "ten times as intelligent as a human" as though intelligence is a scalar quantity and can be measured like this. Think of it this way: if I said you were 276 times as intelligent as a gopher, where would that number be coming from? Likewise, describing a theoretical AI as being ten times as intelligent as a human sounds just as ridiculous. The real thing that bugs me about Ray Kurzweil though, is his total inability to understand why people disagree with him. At one point, he was on a radio show, and a caller described him as a quasi-religious idiot with his head in the clouds. His response was something along the lines of "some people just really seem to have a hard time accepting that this is what the future is going to be like soon." No Ray, I think you have it backwards. One person is having a very tough time understanding that this ISN'T what things are going to be like any time soon. Well, I cannot say that these organic nano-machines will give you eternal life, but you can definitely replace any defective gene or misfolded protein with it, with a healthy replacement, if you have a sample or DNA library of your less damaged DNA structure from your 20s, it is a possibility to continuously generate vectors that replace them given enough time or money to get others to make them. One problem with that is Reverse Transcriptase has a error rate of 1 per 5182 base pairs, so you would still have mutated genes incoming from the reverse transcription process only 1 or 2 errors per Viral Vector but still that could pose a problem with the longevity of the replacements, which in reality mutation and error of DNA Base Pairs is what causes aging the DNA unable to create the proteins that the body or cell needs to survive. This not being Telomeres which is actually the way that your cells count level of mutation based on reproduction, this is because of the amount of mistakes made during replication of 3 Billion base pairs many times with proteins with similar accuracy to Reverse Transcriptase which would make 582 Thousand mistakes per replication, which the Hayflick limit is around 50 to 60 complete replications being 29 million to 35 million mistakes before the cell stops reproducing due to cancer risk, which is around 1% data corruption before shutdown. This is not including the damage from Radiation and external sources only internal to achieve immortality you would need to achieve a DNA reintegration rate of 35 Million per 4 days as that is the average cell life which would be 101 Base pairs per Second replaced. This is what makes immortality difficult you would have to transfect yourself with a Viral Vector every 1.8 minutes to keep yourself immortal with a length of about 10,000 base pairs of gene delivery at 13.13$ per 101 base pairs, sure you can become immortal for 1.1 Million per day for life, I will even sell you the vector MV-x patent "Production" Privileges for 10 million or 180 dollars per Vector type preconstructed, you supply your gene DNA required. We live in the time of God Particles and Nanotechnology it is not about the technology it is about the money do you make 400 Million a year? Not even President Trump could afford such a DNA Reconstruction with a income of between 40 million and 100 million per year based on his reported tax returns released. Richer than Trump? Step Over to the Gene Therapy Tank, we will have you Immortaled up in no time. Mr. Gates are you listening? For a mere 33% of your yearly income of 1.3 Billion you can be Immortal. Know that all your buddies will be so jealous! as long as you don't mind the one shot a day of around 48,000 Viral Vectors. Disclaimer: V.Medvil Corp is not responsible for the possibility of Death or becoming a genetically mutated freak of nature from co-transfection of 48,000 Viral Vectors a day. "Immortality Virus, you have to be joking you mean Immortality Viruses, nature nor man is THAT simple"
Wonder if the new IPhone will have one of these onboard.